Bellatrix, I'm a Pug! 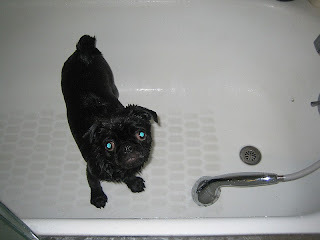 : bath time before the big day! So tonight mommy pics me up from doggie daycare and she shakes her head and says "Thank goodness you're getting a bath tonight!" See for the last few days I've been playing out in the mud, going to work with mommy and having fun will all my friends at "Bring Rover Over", and so I'm pretty much filthy. Casey and I (my best German Shepard buddy) just play so much that I get covered in his slobber, and I've been to the park where it's all muddy....so I'm one dirty girl. I wasn't surprised to see mommy with the bath towels. Daddy caught me mid-wash and while I love taking a bath I find it not kosher to take a picture of me while I'm not suitable for show. I mean really, a pug is always cute right? but when I'm all wet....well I'm just not ready for my closeup. A girl has got to set some boundaries. So tomorrow is the big day....I get "fixed". I asked mommy and daddy what this means and they said for me it's a little different. See I'm a very special doggie, so mommy and daddy says this surgery is real important for me. Some of my friends at the dog park and daycare sniff at me and are confused, but I don't know why. Mommy and daddy told me I'm very rare and that just makes me extra special....see I'm a hermaphrodite. I've had a lot of doctors and everything look at me and I've had to spread eagle a lot! So tomorrow I get this surgery to make sure I'm ok, because mommy says I can't have or make babies and that's ok cause I don't want those. So wish me luck that I'm ok. I'm a little upset I don't get to eat breakfast and us pugs like food. I'll let you know how it goes and send positive pug thoughts my way please. You won't miss anything after being "fixed". It is a little harder to keep our girlish figures but overall its the best thing to have done. Make sure to let us know how things go!